Disclaimer: no tigers were harmed in the making of this delicious, fruity treat! 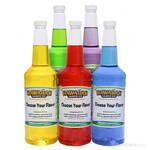 This sweet blend of watermelon and strawberry snow cone syrup is something to be enjoyed by kids and adults alike. Hawaiian Shaved Ice�s tiger�s blood flavored syrup has a hint of coconut mixed in with the fruity taste for an extra bite. Who knew that such a terrifying, fierce animal could have such a sweet side? The whole crowd will want their shaved ice to be covered with this delicious, red syrup. 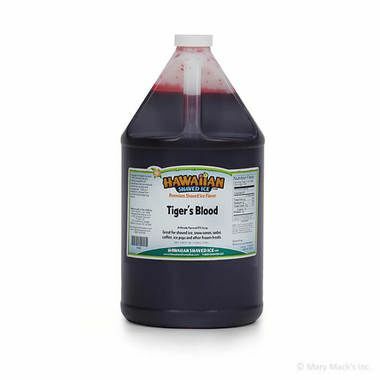 Pour tiger�s blood all over your snow cone and prepare for your taste buds to go wild! Hawaiian Shaved Ice has tamed the wild beast and created the perfect combination of fruit and coconut. 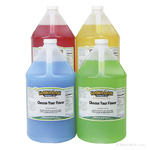 For everyone to enjoy, buy this flavor in the gallon-sized jug. 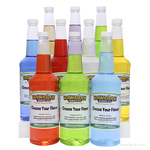 If you don�t want to share with anyone, we have it available in quart sizes and assortment packages as well!